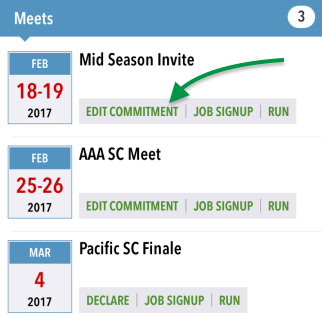 Commit athletes to events, sign up for jobs, and time athletes in races. Access by tapping > Events > Events & Meet Entries. CATEGORY FILTER shows all categories by default; toggle any on/off. Tap a meet to see meet details. The three green buttons at the top take you to the screens described in the sections below. If the Meet Location is defined (halfway down under MEET INFO), tap the Map icon on the right to search for the location in the device’s maps app. For TouchPad meets, tap the TouchPad Live link to see real time results. 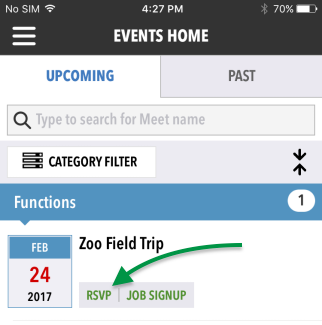 Same as DECLARE, JOB SIGNUP and RUN MEET on MEET INFO screen (described below). 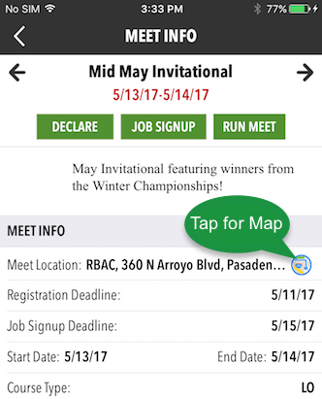 Tap the DECLARE button (may also be labeled RSVP or EDIT COMMITMENT) to sign up your athletes for upcoming meets and events. There are three kinds of events and the process is almost identical for each—select an athlete, select Yes or No if they will attend, enter any notes, and possibly select days/sessions or events in the meet. Select No, thanks or Yes, please if they will attend. Tap SAVE CHANGES and then OK. Tap DECLARE or EDIT COMMITMENT by meet (it will say VIEW COMMITMENT if the registration deadline has passed, in which case you can view but not edit your commitments). You may tap the up arrow by the Yes/No radio buttons to hide notes and make more room for days/sessions. Tap a Day/Session blue bar to see all events for that session. Tap EDIT COMMITMENT by meet. Check the boxes by events you want them to attend. A coach will need to approve them. Takes you to the Job Manager for this event. 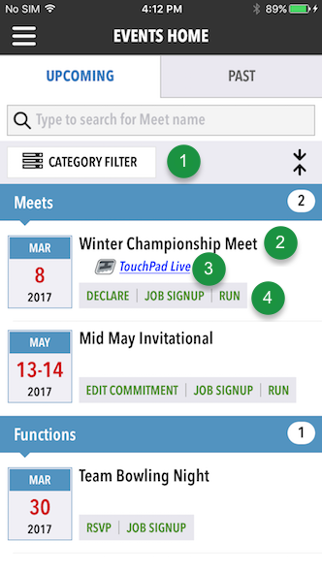 Access by tapping > Events > Events & Meet Entries, then tap RUN MEET by your desired meet. Tap to configure split distances; i.e., what OnDeck considers a lap. Tap an item on the right to cycle through the options, and DONE when finished. Freeform splits means the user can take as many splits as wanted in a race and it won’t end until user manually STOPs it. Number by event shows number of approved athletes in it. You can combine events as follows. Select at least two events to combine. The distance in each MUST match; everything else such as gender and stroke can be different. Once you select one, events that cannot be combined will be disabled. Tap COMBINEat the bottom and confirm you want to combine them. You will get an error if you try combining events where one or more swimmers are in the same events. For example, you cannot combine events 9 and 11 if Chris is swimming in both. You will now see a red C by the combined events. You may tap any of the combined events to time them. To uncombine them, select the same events and tap UNCOMBINE at the bottom. 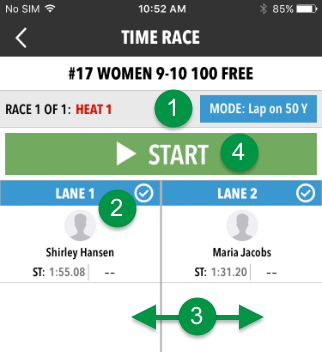 Tap an event to assign heats/lanes and time the race. UNASSIGNED HEATS tab (phone) or header (tablet). 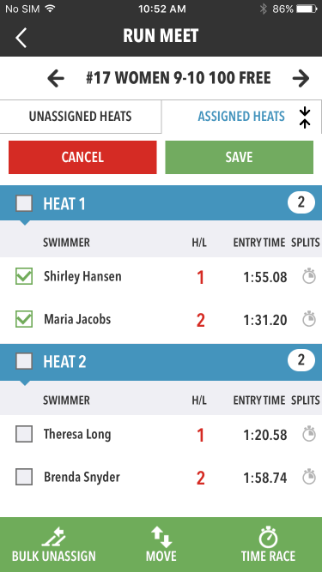 Select one or more athletes, then tap BULK ASSIGN to assign them all to a heat. Tap the ---/-- in the H/L column to assign athlete to heat and lane. As soon as you hit Done, they will move to the ASSIGNED HEATS tab (phone) or HEAT X header (tablet). Tap SAVE after making any changes. ASSIGNED HEATS tab (phone) or HEAT X headers (tablet). Select one or more athletes to see options at the bottom. BULK UNASSIGN — Assign them back to the UNASSIGNED HEAT tab. MOVE — Assign to a different heat. TIME RACE — See below. Tap a number in the H/L column to change their heat/lane assignment. You will need to do this if you used the BULK ASSIGN feature. This is a continuation of the Run Meet section above. You will need to perform the steps there before being able to time the race. MODE — Change whether LAP button is on 25 or 50 Meters/Yards. Tap the checkmark by the lane header to exclude the lane from timing, and again to re-include it. If you have selected more athletes to time than will fit on the screen, swipe left and right to see them. Tap LAP X when a swimmer completes a lap. Tap the green UNDO button if you accidentally tap LAP to continuing timing for that lane. Tap the red STOP button if they are unable to complete the race. Once all athletes have finished, tap SAVE & DONE. Their names will now appear in red with a T by their name indicating they have been timed. Tap a time to change it. Tap a stopwatch to see the splits. Tap the trashcan to delete the result. Select one or more swimmers to then DELETE RESULTS at bottom. Tap < EXIT in the upper left when finished viewing results. To see their full results, tap their name (phone) or thick arrow to hide the list on the left (tablet). You may select the same name(s) and TIME RACE again, up to three times per athlete. If you need to time more races than that, you will first need to delete a previous result (tap a stopwatch, then tap trashcan by result to discard). 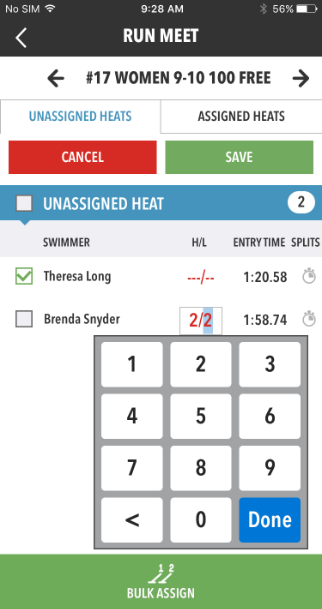 Timed events will show in SwimOffice with a red OnDeck button by them on the Athlete Signup tab. Click the button to see the times. Note these are unofficial results and will not get included in the actual meet results. Same interface as UPCOMING tab. Default date range is three months in the past; change as needed. If meet results were attached to a meet in SwimOffice, the (MEET) Results button will light up so you can view them. We'll take a look at OnDeck meet results in the next lesson.